2.1. Seven in ten registered voters say the United States should reduce its greenhouse gas emissions, regardless of what other countries do. 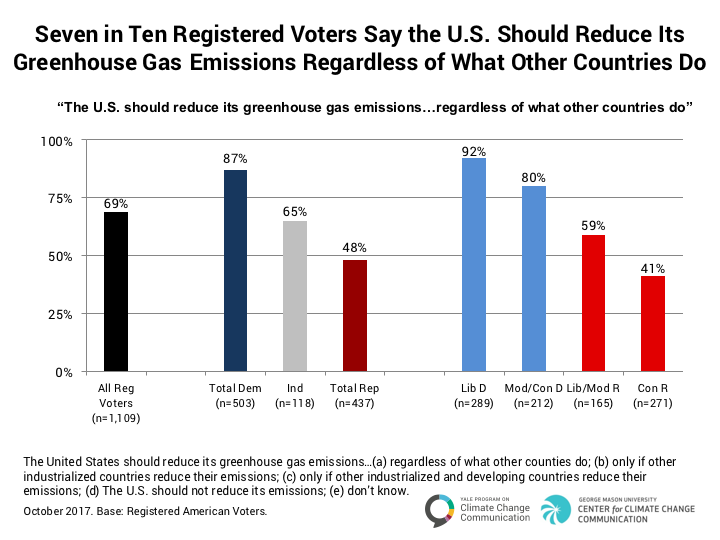 Most registered voters think the United States should reduce its greenhouse gas emissions, regardless of what other countries do (69%). Majorities of liberal Democrats (92%), moderate/conservative Democrats (80%), and liberal/moderate Republicans (59%) take this position, as well as four in ten conservative Republicans (41%). Only 5% of registered voters (including only 1% of Democrats and 4% of Independents, but 12% of Republicans) say the United States should not reduce its emissions (see Data Table). In December 2015, officials from 197 countries (nearly every country in the world) met in Paris at the United Nations Climate Change Conference and negotiated a global agreement to limit global warming. On Earth Day, April 2016, the United States and 174 other countries signed the agreement, with all of the other countries following suit since then. On June 1, 2017, President Trump announced that the United States will withdraw from the agreement. 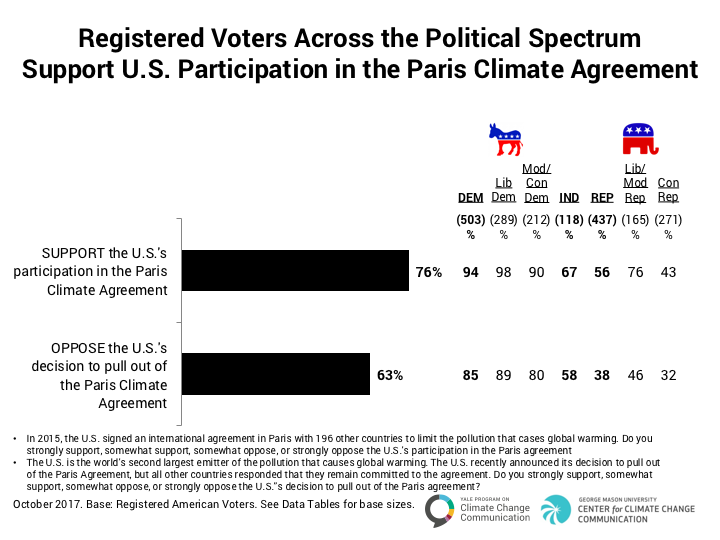 In direct contrast to President Trump’s decision, three in four registered voters (76%) support U.S. participation in the Paris Climate Agreement. Support ranges across most of the political spectrum, including a large majority of Democrats (94%, including 98% of liberal Democrats), two in three Independents (67%), and the majority of Republicans (56%, including 43% of conservative Republicans). Similarly, the majority of registered voters (63%) oppose the United States’ decision to pull out of the Paris Climate Agreement, including 85% of Democrats and 58% of Independents, but only 38% of Republicans.